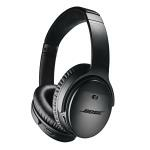 Bose is excited about the second generation of these classic headphones. If the original was good, they believe QuietComfort 35 Wireless II is even better. In fact, as they say themselves: "The best from Bose. Now even better". Some would say their noise cancellation is world-leading, such is its reputation. Whether it's world-class, or world-leading, the technology is adaptable depending on your mood. Choose your level of noise cancellation, and enjoy the music the way you want to enjoy it. No matter how loud you like to play your music, the Bose QuietComfort 35 Wireless II delivers clear, almost-perfect sound through volume-optimised EQ. One of the key additions to this second generation QuietComfort 35 is a dedicated button for functions like Google Assistant or Siri. Just press the button, start talking, and everything you need to assist you will kick into action. Comfort has always been a big selling point for Bose headphones, and the QuietComfort 35 Wireless II offers a wonderfully comfortable listening experience, thanks in part to the luxurious feel of the ear cushions made from synthetic protein leather. So comfortable, you'll want to keep wearing them and keep listening to your favourite music. This is made possible by the Lithium-ion battery which gives you up to 20 hours of wireless listening with every charge. And if you do get caught short, you can plug in the included cable to keep the music humming along.